Crabominable in game: 120 Who? Important notice! Pokemon Crabominable is a fictional character of humans. Crabominable (Japanese: ????? Kekenkani) is a dual-type Fighting/Ice Pokémon introduced in Generation VII. Crabominable is a crustacean Pokémon resembling both a horsehair crab and the mythical yeti. It is mostly white, with a blue face and details, and light yellow hair with two taller hairs sticking out on top. It has fur, and has extra furry spots around its arms, mouth, and claws. Its arms are segmented into three parts, with a blue dot on the middle segment. Its claws have the appearance of a dark blue foot print or paw print, with the biggest mark being the actual claw. It has four legs with blue tips made out of ice, which will freeze you if you touch them. Its face consists of a light blue "mask", closed eyes and a large mouth that goes down into its chest fur. It has two large teeth showing as well. It has a marking on its chest probably to make it appear more like a yeti, which is usually portrayed as ape-like. On its stomach is an armor plate that is blue with light blue stripes. 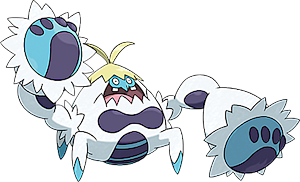 Crabominable is the only new Ice type Pokémon introduced in Generation VII. Crabominable has the longest English name of all known Pokémon, with 12 letters. 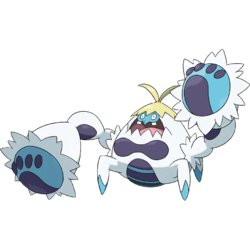 Crabominable is likely based on a horsehair crab or the genus Kiwa hirsuta, commonly known as the Yeti Crab. It also shares traits with the mythical Yeti. Kekenkani may be a combination of ?? kegani (horsehair crab) and ?? kenka (fight).